Don’t forget: the book mentioned below is available at 20 percent off for tablehopper readers for two weeks following this mention at Green Apple Books—simply use the code “tablehopper” at checkout (either at the store or online) for your discount. The time has finally come for me to review a cookbook without actually cooking anything from it. I know, bad journalism. But I’m a bookseller, not a journalist. And if you gave me one of the wontons pictured on page 48 and didn’t tell me what was in it, I’d gladly eat it, and probably like it, and even after you told me what was in it, I’d eat another. But I can’t fire up the stove for this one. What the hell am I blathering on about? 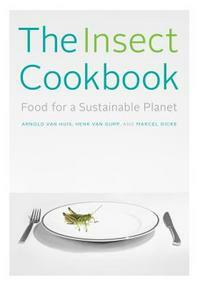 The Insect Cookbook: Food for a Sustainable Planet by Arnold van Huis, Henk van Gurp, and Marcel Dicke (Columbia University Press, $27.95). Need I go on? You probably either know you want it already or would never crack the spine, so what more to say? Well, it’s an interesting read in and of itself, not just a recipe book. In fact, from the Kofi Annan piece focused on educating Western eaters to the analysis of health benefits, this book is thought-provoking at the very least. It’s also beautifully done, with lots of full-color photos—a great value at only $27.95. And yes, there are notes on sourcing (though they’re minimal).